An internship cover letter doesn’t function like a typical cover letter. In fact, it has to work a lot harder. Chances are that if you’re applying for an internship, you may be lacking in "real" work experience. But that’s why you need an internship, right? The internship cover letter should focus more on what you want to do, rather than what you’ve done. However, don’t be afraid to add previous work or extracurriculars that you think may not be relevant. For students just starting their careers, any experience is good experience. First, start by introducing yourself, and state the position for which you are applying. Next, give background information on what you’re currently studying as well as your intentions toward a career in that particular field. It also doesn’t hurt to mention something you’ve learned about the company during your research, such as future projects they plan to work on that you’d love to be involved in or recent changes that reflect the kind of company dynamic for which you hope to work. Use a small paragraph to talk about what you hope to do with your major and career upon graduation, and discuss how an internship with that particular company can help you reach your goals. In the final paragraphs, you can showcase your previous work experience as well as your extracurricular activities and volunteer work. Finally, close your internship cover letter by providing your contact information in addition to your desire to work and learn from the company through an internship opportunity. 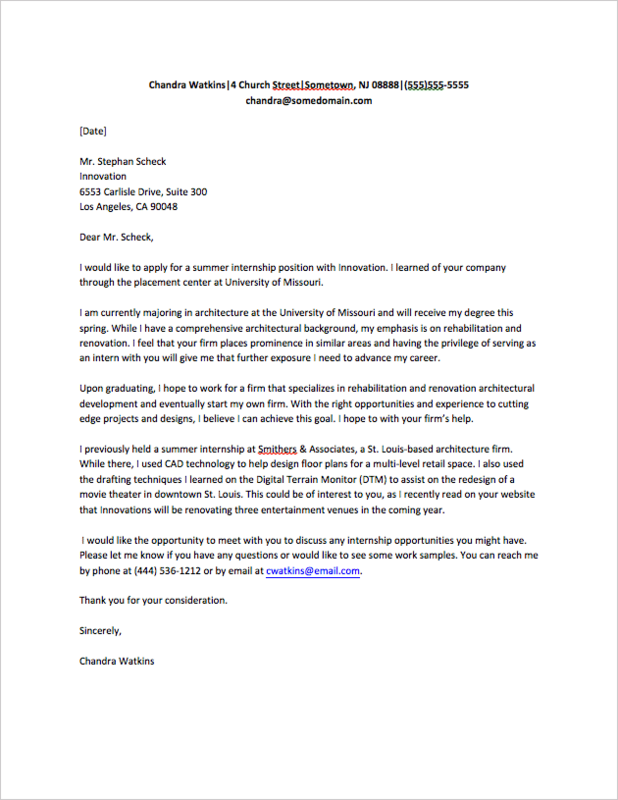 Check out the below example for a little more guidance on your internship cover letter.